Thanksgiving Spinach Salad with Dried Cranberries, Almonds, and Goat Cheese is a delicious way to get some greens on the holiday table, and this makes a lovely salad for Christmas too! And this tasty salad is low-glycemic (if you use the cranberries conservatively), gluten-free and South Beach Diet Phase Two. Use the Thanksgiving Recipes to find more recipes like this one. 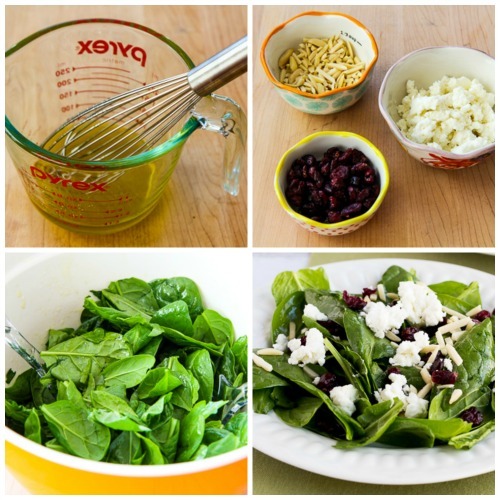 Click here to PIN this Thanksgiving Spinach Salad! Watch the video to see if you’d like to make Thanksgiving Spinach Salad with Dried Cranberries, Almonds, and Goat Cheese! I’m always on a quest for Carb-Conscious Thanksgiving Recipes at this time of year, but truthfully some of the Thanksgiving recipes I created in the very early days of the blog are still my favorites. Back in 2007 I spent a couple of hours looking through 20 years of November issues of my favorite food magazines and then marched into the kitchen and came up with this Thanksgiving Spinach Salad with Dried Cranberries, Almonds, and Goat Cheese without a recipe except the one I made up in my head. I’ve served this many times through the years, and it’s always been a hit! Dried cranberries are traditional for Thanksgiving and I think the small amount used here really gives the salad a Thanksgiving feel. Still, dried fruits are higher in concentrated sugar than fresh fruit, so if you’re a low-carb eater or a South Beach dieter, be sure to use a small amount of dried cranberries compared to other ingredients. Of course if you’re making this on Thanksgiving Day this salad is still going to be a pretty healthy alternative compared to many Thanksgiving foods, even if you splurge on the dried cranberries, so enjoy! Whisk together the white balsamic vinegar, agave nectar (or sweetener of your choice), olive oil, and salt to make the dressing. Measure out the salad toppings. (Thanks to Ree for the cute measuring cups that came in the mail!) 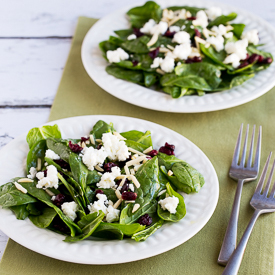 Toss the spinach with the dressing (you might not need it all) and top each salad with the almonds, goat cheese, and dried cranberries. That’s all there is to this delicious salad. I promise, this salad will be a big hit on the Thanksgiving table. If some people don’t like goat cheese, use Feta or Parmesan for a salad that will still be delicious. 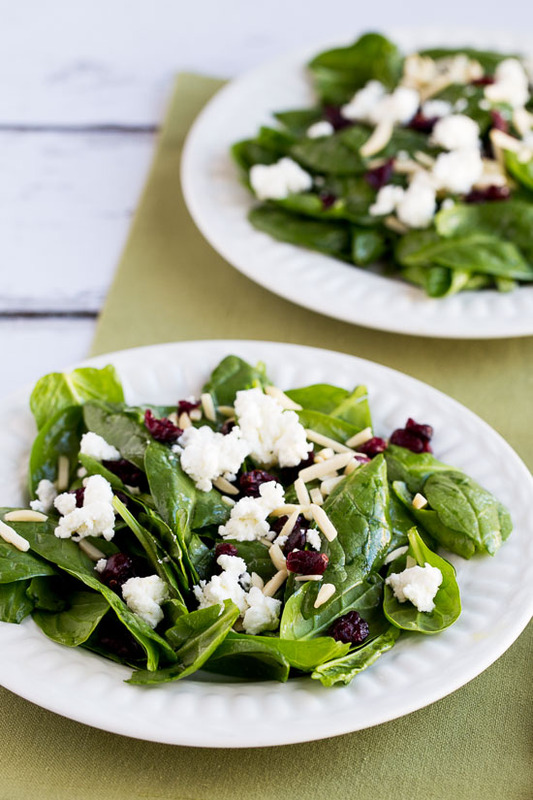 Thanksgiving Spinach Salad with Dried Cranberries, Almonds, and Goat Cheese is a delicious way to get some greens on the holiday table! Wash spinach if needed and spin dry, then place in large bowl. Whisk together balsamic vinegar, agave nectar and salt, then whisk in olive oil. Toss spinach leaves with dressing (you may not need all the dressing if you prefer your salads on the dry side). 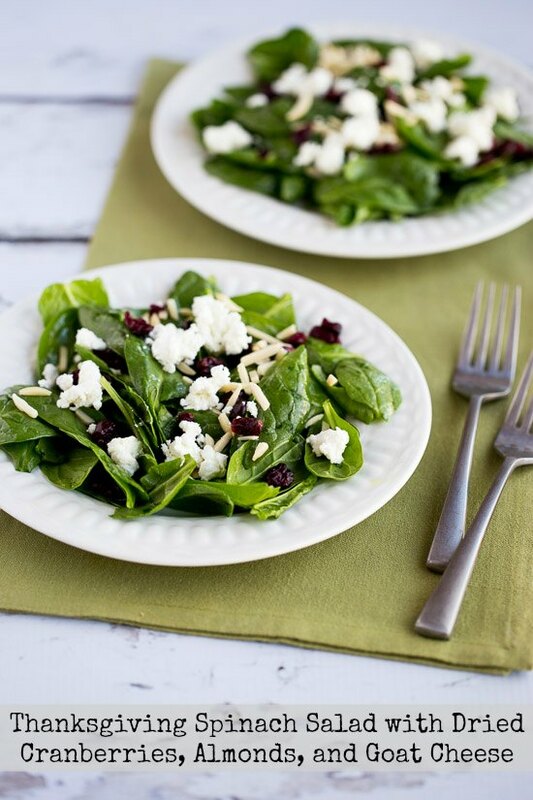 Arrange spinach on individual serving plates and sprinkle each salad with dried cranberries, sliced almonds, and goat cheese. Serve right away. Dried cranberries are relatively high in sugar, so even with the small amount used in this recipe, this Thanksgiving Spinach Salad with Dried Cranberries, Almonds, and Goat Cheese is definitely a splurge for South Beach Phase Two and probably too high in carbs for a low-carb eating plan. If you don’t want to splurge, the salad will still be delicious without the cranberries. Next Post » A New Responsive Design for Kalyn’s Kitchen! I love the goat cheese – it adds a creaminess and slightly tart flavor to balance the sweetness of the cranberries. Lovely salad! Thank you! I think every salad needs goat cheese. Love this recipe Kalyn–so glad you reposted it! Thanks Letty; it's always such a hit! This is just like one that I make often, I just never had a recipe. Would like your permission to share this on my site (giving you credit, of course). Dawn, I give permission to share the photo if accompanied by a link to get the recipe from my site (and as long as the recipe itself is not reprinted with the photo.) Thanks; glad you like it. I buy all ingredients for this at Trader Joe's. Delicious salad! I make it often. Looks great! I love dried cranberries in my salad…I usually do one with feta, almonds, and craisins, with a maple mustard dressing! So pretty for fall/winter too! Very good. I make a baby spinach salad with craisins (well, fruit-sweetened organic dried cranberries these days), the occasional grape tomato, nuts (sliced almonds are my fave) and crumbled blue cheese with a maple-balsamic vinaigrette (equal measures balsamic vinegar, maple syrup and olive oil–but agave nectar would be a perfect sub). I’m actually planning that salad to go with my Tgiving meal–along with another favorite: pureed white beans instead of mashed potatoes! Mmm! I love dried cranberries! I just made a similar salad (right down to the goat cheese). I’ve found that grape seed oil is a really nice alternative to olive oil in salad dressings. My dressing for my similar salad was white basalmic, grape seed oil, a little bit of all fruit raspberry jam (the natural sugars might now work with the diet you are on), and a squirt of a course ground mustard. I don’t usually comment here but I’ve recently fallen in love with dried cranberries so I thought I would say hi. i am always at a slight loss when it comes to making salads and coming up with interesting ingredients for them. this one sounds delicious. perfect for thanksgiving indeed! Yum! This is a salad I could grab onto! I love dried cranberries. Funny thing is – I remember interning at an ad agency in college in Boston on the Ocean Spray account…They had me in an office once, glueing a “new product” to fill a map of the US – a product they called Craisins. If I knew then what I know now! Meeso, thanks! I try to find interesting things to cook. Joanna, I agree, perfect for winter. Chigiy, agave nectar is really very tasty, and it’s completely natural. The amber type tastes a lot like honey. Helene, great idea. I didn’t think about the colors, but it looks very Christmas-like. Tanna, laughing here. I usually have 100+ photos, so it does take a while. I will try to eat more slowly and not wolf down my food! I promise! The salad looks and sounds really fabulous and one I know I will be making. I can never be getting too much spinach or cranberries. Looks really good. Anything with goat cheese. This could probably be on a Christmas buffet also. This looks yummy. I’ve made salads that are similar using toasted pinenuts or candied nuts instead of almonds. Almonds are probably way more healthy. I’ve never tried agave necture though. You’re the best resource for fresh food recipes…they are always amazing!!! Peter, never too many spinach salads. Please post yours and I will add it to my links! Great salad Kalyn and it’s funny how 2 people can be thinking about the same foods. I was going to post my spinach salad today but now I’ll wait a bit! I love dried cranberries, and hats off, really, to Ocean Spray for marketing them now as “craisins.” You can find them in my local markets in the produce section, near the nuts and other dried fruits. Kalyn, this looks really fantastic. Here, cranberries are not common and dried ones are only just making it onto the scene. Also goats cheese is relatively expensive. But the dish looks so delicious, so simple yet really inviting. I am going to save it for our summer holiday season (Dec – Jan).